Woke, rose, walked Mix and breakfasted. I feel as though I am inhabiting someone else’s body today, someone at least twice as old as I am – nothing seems to work but everything seems to ache. Couldn’t find Rachel anywhere – she had gone off to Berwick to buy two apple-trees after my intelligence yesterday (as a result of our visit to the Garden Centre) that there was a sale of trees and that they had two Cox’s Pippens. The local paper also came out today with quite a spread about Rachel’s loom activities. 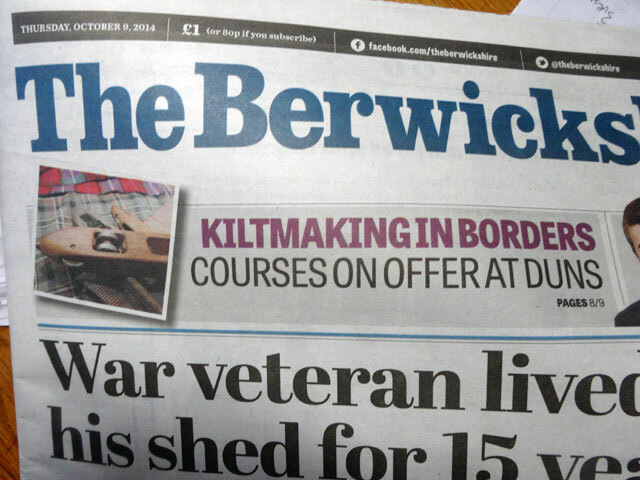 You can access the story at www.berwickshirenews.co.uk (and there is some video as well). I asked Ewen and Jane what they would like to do. Jane was happy to work on her photographs, Ewen fancied a long walk. So we set off with Mix and wandered around by Fogo and back round by Nisbet’s Hill which took us around a couple of hours. I thought that this would ease my aches – I have to say I was mistaken. However when we returned, Olivebank was waiting for me, sitting in the middle of the courtyard. Olivebank had been brought down here by Andrew’s Garage in Helensburgh. Her arrival was spectacular. 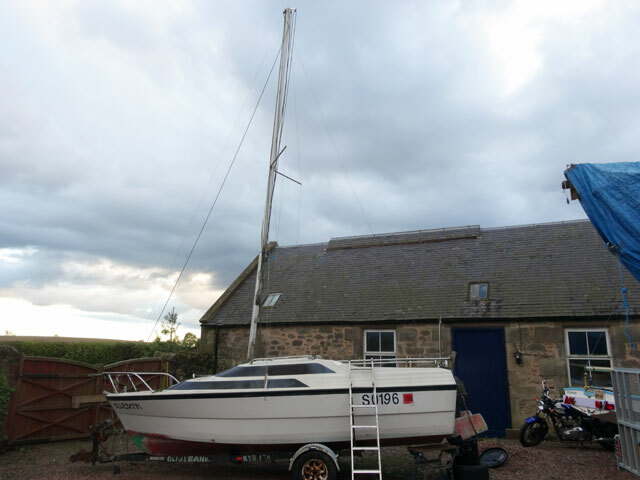 The boat was on a trailer which was on a breakdown truck which (having broken down) was on another break-down wagon. What a way to arrive! But it was good to see her. We all celebrated with soup and cheese in the farmhouse after which Ewen went off for another walk, this time with Digger and Heidi. David and Tom and I erected Olivebank’s mast and started drawing up lists of all that required to be done to get her back into a ship-shape condition – and we drank coffee. I drove David to Swinton to collect his car (which had passed its MOT test) – I had collected him from Swinton this morning – and then Ewen and I went off to Berwick to collect Mum from her train, following her return from holiday which she had spent in a timeshare at Cameron House with her sisters. She had had a good time but the train journey home had been a busy one. We all dined in the farmhouse and then Ewen, Jane and my mother joined Rachel and me in the Granary where we saw all of the holiday photos which Jane and Ewen have taken during the first five weeks of their stay in Scotland. They have had a busy time and seem to have been everywhere in Scotland – Fife, Aberdeen, Luss, and a two week island hop of the Western Isles courtesy of Caledonian MacBrayne – and it is not over yet as they have another week and a half to go before they return to Australia. We walked the dogs and quickly fell asleep. As recently as a few years ago, it was feared that kilt-making was in crisis. A Sunday Herald story even estimated that “there are perhaps as few as ten authentic kilt-makers in Scotland”. 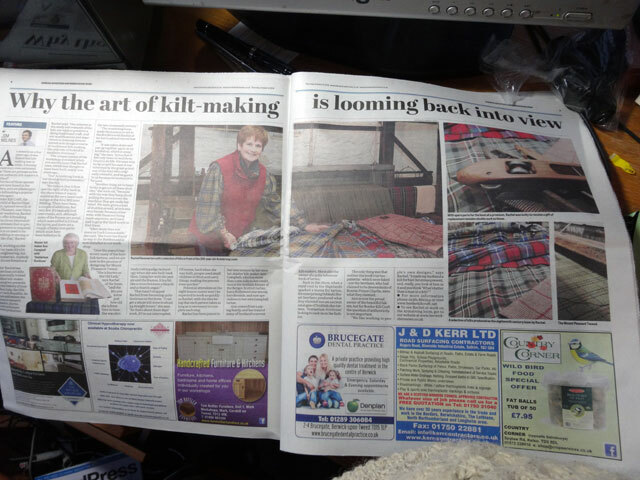 But two of those specialists are now based in the Borders, and are planning to make kiltmaking a popular pastime again. Border Kilt Craft, the brainchild of Rachel Hammerton, opened recently at Mount Pleasant, near Duns. In her workshop, Rachel plans to offer kiltmaking courses to those interested - and she stresses that no previous experience is required. “There is no need to be good at knitting or sewing or anything like that,” Rachel said. Director Rachel has made more than 100 kilts as a professionally trained and qualified kilt-maker. The unique nature of the workshop is evident when you see the loom that Rachel uses, which was thought to have been built nearly 200 years ago. “Our Armstrong loom is our most prized possession,” says Rachel. 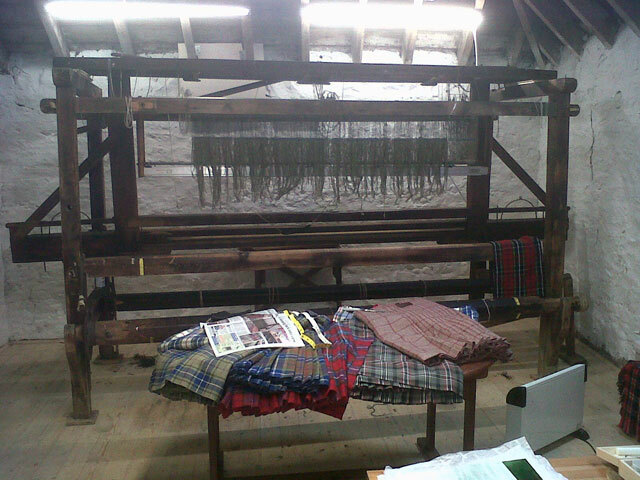 The Armstrong loom made the journey south to the Borders with Rachel after her husband retired last year. “It was taken down and put up together again in my workshop, which is amazing,” she says, “given that it has only been moved three times in its life. We were very lucky as well because it was inherited by the great-grandson of the man who originally owned it, and he gave it to us because he wanted it to be used. “Another thing we’ve been lucky to get are all these shuttles,” she went on, “because with the way they bang about pulling the yarn across the machine, they get really battered. We were given a load of shuttles as well, which was very handy, because otherwise, with them not being made anymore, we’d have had to go to the third world to find them. “After more than 100 years on Loch Lomondside,” she said, “the loom has found its way to the Borders and is now installed in our workshop. “Over the years it has woven many of the Scottish tartans, and we are now in the process of designing the Mount Pleasance Tweed. Potential attendees on the eight lesson course won’t be expected to work as quickly as Rachel, with the idea being that each person takes as long as is necessary to complete each step. Rachel has been joined in her new venture by her mentor, master kilt-maker Ann Campbell, who has more than 1,000 kilts to her credit. Ann is the Scottish Keeper of the Bergen Scottish tartan, has a Hollywood star among her clientele, and now specialises in her own Campbell tartan. Ann comes from a piping family, and has trained many of Scotland’s current kilt-makers. She is also the owner of a quite infamous book of tartan. Back in the 1820s, when a royal visit to the Highlands sparked a mania for tartan, the enterprising Sobieski Stuart brothers produced what they claimed was an ancient catalogue of Scottish clan tartans, ‘Vestiarium Scoticum’ looking to cash in on the fashion. The only thing was that neither the book’s tartan patterns - which were faked - nor the brothers, who had claimed to be descendants of Bonnie Prince Charlie, were what they claimed. Ann is now the proud owner of the beautiful fakery, but for Border Kilt Craft the question of authenticity is not important.